The HeatPac25 provides fresh warm air at a temperature rise of 80° over ambient. A great pair with the Super Vac Rapid Tent. Featuring a 8? 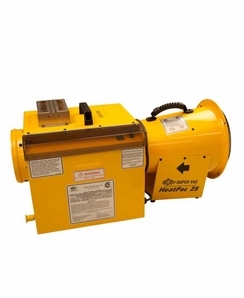 blower and CGA approved heater, the unit is portable and connect to a standard propane tank. The supplied 25ft of duct allows you to deliver warm air with precision.